Onychatrophia, also known as atrophy; describes the wasting away of the nail; the nail loses its shine, shrinks, and falls off. Many people are familiar with the concept of atrophy. The word is commonly used in reference to conditions that affect the elderly, someone who has had an extended hospital stay, or someone who lives a sedentary life. “Atrophy” is simply the wasting away of a part of the body. Many times a person’s muscles are described as having been “atrophied.” This means the muscles have decreased in size, weakened, and have generally lost the ability to perform as expected. The same thing can happen to nails. Whether the result of damage to the matrix, which would affect only one nail, or a larger health issue, which could affect all 20, the nails can atrophy. When a nail is atrophied, it loses its healthy look, begins to shrink in size, and may eventually wither away altogether. Unlike muscles, however, the nail can’t regain its vitality and health. 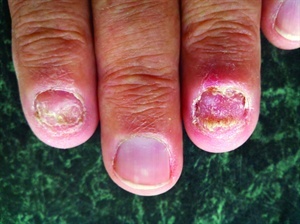 Once a nail atrophies, a condition known as onychatrophia, the condition is not reversible. “Onychatrophia is a scarring process,” says Dr. Philippe Abimelec, a dermatologist from Paris, France, who specializes in hair and nails. Similar to a scar on the skin, once the damage is done, the nail won’t recover.